A recent interview in Best Buy's official @Gamer Magazine reveals that plans for a Pokémon based on the lovable creature above were scrapped after being deemed too controversial. What's controversial about Dolly the sheep? She's a clone. Or she was a clone, at least. Dolly the sheep, often referred to as the world's most famous sheep, was cloned by Ian Wilmut and Keith Campbell at the Roslin Institute near Edinburgh in Scotland back in July of 1996. She gets her name from the mammary gland cell used to create her and Dolly Parton, the country western singer known for her own impressive mammaries. Cloning an entire animal from a single cell is a significant scientific achievement. Dolly was the first mammal created using such a cloning process. She was developed using a process called somatic cell nuclear transfer, in which an adult cell is transferred into an unfertilized egg that's had its nucleus removed. Electronic stimulation is applied to get the cell to begin dividing, and once a blastocyst is formed the clone embryo is implanted in a surrogate mother to be brought to term. The end result was Dolly, a full-functional example of female sheepdom. Through the course of her brief life she gave birth to six children. She was euthanized in 2003 after suffering from lung disease and severe arthritis. Now she stands on display in the Museum of Scotland, a monument to science and ingenuity. Doesn't look too shabby for a dead sheep, does she? 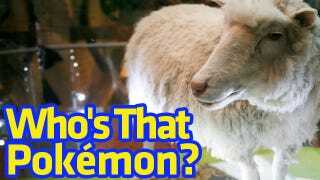 Junichi Masuda and Ken Sugimori, Pokémon developer Game Freak's directors of development and art, told @Gamer that a Pokémon named after Dolly was considered too controversial. This is coming from a game featuring a creature that evolved by crawling into the skull of its dead mother. Cloning a living creature is a controversial issue. It raises questions about the nature of god, the value of life, and many other topics that scientists like to debate when they aren't cloning the hell out of everything that moves. Still, it seems unfair to deny Dolly the honor. After all, she didn't ask to be cloned.